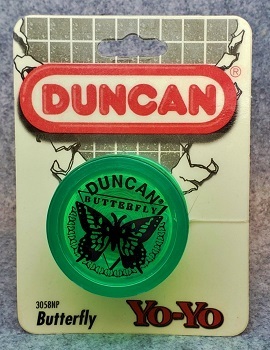 1994 version of the venerable Duncan Butterfly in translucent green plastic and black imprint. 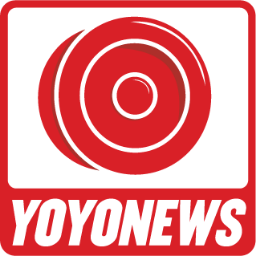 The butterfly design has changed numerous times since 1958 when the first Butterfly yo-yo was introduced by Duncan (invented by Wayne Lundberg). "The Original and best selling string yo-yo of all time! A favorite for [more than] 60 years, the Butterfly® offers a wide shape that makes landing the yo-yo on the string much easier. It features a flared shape, steel axle, and durable plastic body that can withstand impact. It's great for learning the basics of yo-yoing!"